Last week I told you about waiting for my Winky Dink kit to arrive while sitting in the kitchen in front of the green sink and watching the clock. Sarah, one of my Grandma Blog Buddies at Magnolia Surprise commented on the fact we had a green sink. I told her that sink deserved its own post. It wasn’t just any green sink. It was a brand new 1956 Frigidaire sink and dishwasher combination. Yes, I said dishwasher. I remember that sink and everything about it! Daddy worked for Consumers Power Company, which is the electrical company for Michigan. This meant our house was always electric! It also meant that he got discounts on appliances and things. That old house was built in the 1890s and Dad was slowly remodeling it. He had already replaced the back porch and the furnace and was working on the kitchen. He put in a big new picture window where the old small paned one used to be. It made the kitchen so much lighter. I almost remember the white sink that he replaced next. The whole family went to some appliance store in Jackson and they spent hours picking it out. Hours as in my sister and I were very bored! Hours as in all they did was argue about which one to get. The fun part was going to Jackson meant we got to go out for dinner. There was this cafeteria in Jackson and it was my favorite place to go eat. I want to thank Robert Seger at Automaticwasher for giving me permission to share this photo. This is exactly what our new sink and dishwasher looked like. I visited that old house in 1971 and that sink and dishwasher were still there but the dishwasher no longer worked. I can’t wait to go back and visit that house again and see how different that kitchen looks now. This memory was posted in Memories FOR Amara and tagged dishwasher, Frigidaire, green sink, Kc the child on July 26, 2014 by Grandma Kc. Now that is funny! The idea of my mother giving tours of our kitchen! I am pretty sure that Dad bought the dishwasher in hopes of having clean dishes. Nope! Even in the ‘good old days’ DIY projects brought out the worst in people!! That is one cool looking sink! I’ve never seen one like that! I’m so glad you got to see the kitchen again. I think of you every time I go by that house! Now that you know more of these stories you will have fun going with me when I go see it again. I read on Zillow or somewhere that they have remodeled a lot inside – you sure can’t see much difference on the outside. I’d also love to see if we can find the old land deed or anything on file that would show where the old property lines were. Next year I hope! Wow, a dishwasher during that time would have been considered a luxury. The only dishwashers in my house growing up were mom, my sister and me. I hope you get to visit the home again, it would be great to see how it looks today. I have lots of family and friends still living there so I really do plan to go home and visit again – maybe next year depending on flight prices! Once I know when I will go I am going to try and contact the people in advance as I really do want to go inside again. The 50 acre farm has been subdivided and the barns are all gone but the exterior of the house looks much the same. It will be a wonderful adventure! Oh, how I love your childhood memories! This is absolutely delightful – I had no idea there was a green sink/dishwasher combination and the picture you included is wonderful. How memories can stick with us forever. Your details have me reading on to see what else is there. Thank you for sharing, kc, and keep writing! Thank you, Sarah. I certainly appreciate the praise and I do seem to have the memory of an elephant! I really am glad that I decided to add these to AmaraLand. I think my mom picked green because it matched the wallpaper in the kitchen. I think you could also get it in pale yellow or blue. I’m with you – orange would be cool! I had never even heard of anything like that. Talk about your mid-century modern, wow! I laughed and laughed about the hammer flying. There isn’t a household project that doesn’t involve some amount of frustration. I’m pretty sure Ikea and Pinterest have been the cause of more than one argument! I was so excited when I finally found that picture and even more excited when he answered my email in less than one day! I’ve emailed other people before requesting permission and up until now YOU have been the only one to answer the email. He is my second and I am glad he let me use it. I couldn’t find any pictures in that kitchen in my stuff and it really was unique! That’s awesome! I’ve never even heard of a sink/dishwasher combination. My mom had four daughters who were the dishwashers. We didn’t have an electric one. But we did have Harvest Gold appliances. It was kind of odd to have something so new and so modern in that old farm house. We had harvest gold ones when I first got married – the kind with 2 stoves! Loved that thing! First off, thanks for the mention — you are just too too sweet! I WANT THAT SINK!! Who cares if it doesn’t match my kitchen! What an absolutely great invention — I bet all the housewives 😀 were envious of your mom’s kitchen! (I, of course, was the chief dishwasher in my family) Did you check out the apron, and the clock? And the price? $450 had to have been a lot back then! My mother certainly never dressed like that around our house! I do love the apron but then I love wearing an apron, too! Wish I had one like that with all of Paris on it! So modern! What a great memory of a fabulous appliance. I had no idea they made such combinations. It surely made all the neighbors green themselves, with envy! DIY jobs sure do supply some not so happy memories. My daughters have a few of their own from times Jim and I worked on things… or times the girls helped Jim with this or that. He’s a pretty good guy — until he can’t figure something out, and not being a true DIYer, that was pretty much every time he attempted such things. Still is that way! I love the fact that Grampy doesn’t even try to do those kinds of projects. He knows his own strengths and being a hand man isn’t one of them! He would much rather hire someone and I am so glad! I just loved this! And that perky little housewife whose day is made when a glass comes out of the dishwasher with a sparkle on it! 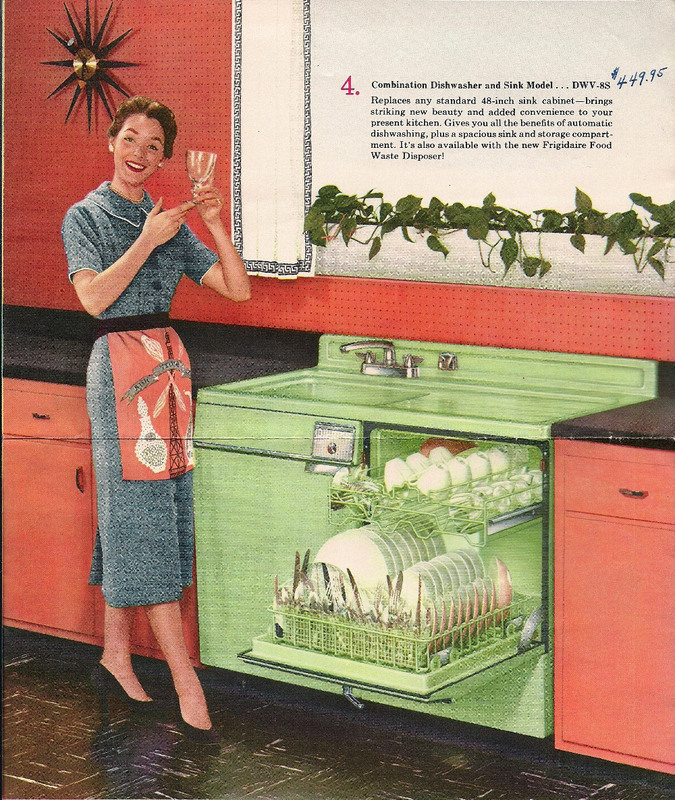 When we finally got a dishwasher – not this deluxe one though! – there must have been issues installing it. The appliance had to be pulled away from the wall so the pipe could empty dirty water into the sink. After a few washes, mom decided it wasn’t worth the trouble, so it sat there unused and my sisters and I were back on the job – boo! It really was a very fancy appliance for such an old farm house. I do remember having a dishwasher like you described when my girlfriend and I rented our first place. It was so noisy, too and you always wanted to use the faucet while the dishwasher was hooked up! When you go back to visit and the dishwasher combo is still there make sure to take pictures. I am pretty sure it won’t be there! I found a real estate listing for the house on Zillow.com. It sold again a couple of years ago and it said the kitchen had been completely remodeled. It will be fun to see what it looks like now. I must admit I love the green kitchen sink! I really love retro styles. I feel like things today just lack that kind of style and personality. You guys were really ahead of your time with an appliance like that too! Very cool. Thank you so much for stopping by. Deb is such a lovely gal…so happy to have connected with her through the linkups. If you do make those blueberry muffins let me know how they turn out 🙂 Have a wonderful weekend, Grandma Kc. Thank you for stopping by AmaraLand. You’re right Debra is very special! I am glad she introduced us. I do hope Amara and I get a chance to make your muffins this weekend. She loves to try new recipes and she really loves blueberries. I always have to get extra as she eats them while we cook! Somewhere my mom has a picture and newspaper article of my grandma with the first electric stove owned in their little town. This is the first I’ve heard of a washer, sink combo. I’ll tell you though, my first dishwasher, that hooked up to the sink thirty plus years ago was the best one I’ve ever owned. No rinsing, everything came out spotless. I certainly don’t thing some appliances have improved. I would love to see that newspaper article! I bet your Grandma was the talk of the county! I think today almost everything is built to be replaced. They used to be built to really last. We have a dishwasher in our house that I haven’t used since the first month we moved in. It is too loud and too expensive to run and it doesn’t get stuff clean!